In this episode of BTS84, Gabe gives us the details on the day’s massive arm workout that includes tons of super sets for an incredible pump. 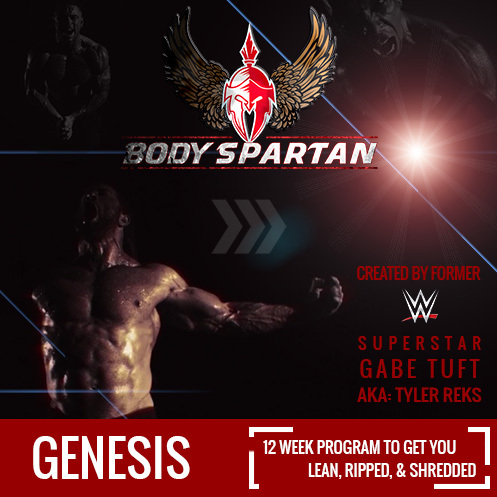 We also get answers to some of the most commonly asked questions on Body Spartan’s website, social media, and Live Chat – regarding the Genesis program and fitness in general. Full video and arm workout below! Everything in this workout should be done with strict form. Gabe used mostly super sets in this workout to get a massive pump. The final two exercises were isolated for each muscle group with high reps and low rest. Same form for both triceps and biceps here. All we’ve done is change the grip width and hand positions. Refer to the BTS84 video above for an explanation of the form for both of these. Keep the elbow in tight as much as possible and soft lock at the top. Make sure to stop the momentum at both the top and the bottom and use ONLY the triceps to move the weight. This is done by contracting the triceps only, or as much as possible. Get a good 1/2 second contraction at both the top and bottom of the movement. Be sure to avoid swinging the dumbbells on these. Curl both arms at the same time to minimize rest in between reps and to keep constant tension on the muscles.